The recent launch of the White House’s “My Brother’s Keeper” initiative has brought new energy and attention to the challenges facing America’s young men of color. Since 2011, NYC’s Expanded Success Initiative (ESI) has been working to boost college and career readiness and other key outcomes among Black and Latino male students in 40 NYC high schools. Ultimately, ESI aims to identify effective practices that might be expanded to other schools and possibly other districts. 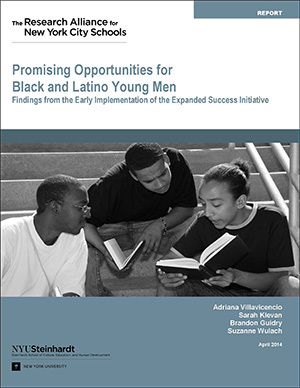 The Research Alliance’s new report, Promising Opportunities for Black and Latino Young Men, presents a rich picture of ESI’s roll out and first year of implementation, drawing on more than 100 interviews and focus groups with educators in ESI schools. The report examines challenges these educators experienced, as well as changes in school practice that hold promise for reaching ESI’s goals. The report is designed to offer useful insights not only to ESI schools and the NYC Department of Education, but also to other schools and districts around the country that are working to better engage young men of color. The Research Alliance’s evaluation of ESI is ongoing. Future reports will examine ESI’s implementation in subsequent years of the initiative, as well as its impact on a range of academic and social/emotional outcomes.